NEW DELHI: Ten personalities in the fields of social awareness, music, literature and the arts are to receive the annual Master Deenanath Mangeshkar Awards later this month. 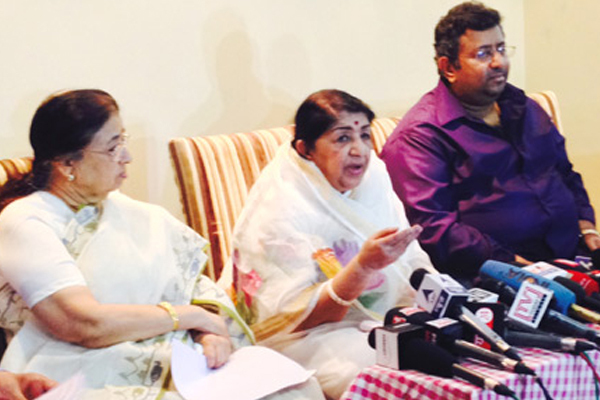 Bharat Ratna and legendary singer Lata Mangeshkar told a press conference at her residence in Prabhakunj in Mumbai that the 25th edition of the awards will be presented by her at a function on 24 April at Shanmukhananda Hall, Mumbai. While tabla player Zakir Hussain and classical vocalist Pandharinath Kolhapure (father of actress Padmini Kolhapure) will be given the Master Deenanath Paritoshik awards for music, senior actor Rishi Kapoor and the versatile Marathi actor Shivaji Satam will get the Master Deenanath Mangeshkar (Vishesh Paritoshik) awards. The Master Dinanath Paritoshak will be given to two journalists Anant Dixit and Prakash Bal, while the Vagvilasini Paritoshik will go to litterateur Dr Anand Yadav. Dinesh Pedanekar and Mukta Barve get the Mohan Wagh Puraskar for the Marathi drama 'Chapa Kata'. Anna Hazare gets the Master Deenanath Mangeshkar (Jeevan Gaurav) for social awareness and Miraj Vidyarthi Singh receives the Anadmayee Paritoshik for social service. The awards will be organised by Master Deenanath Mangeshkar Smriti Prathishthan Trust, which celebrates the memorial day of Master Deenanath Mangeshkar every year on 24 April where legendary actors, film makers, social activists, musicians, singers, dramatists, dramas and poets are felicitated for their respective outstanding contributions in their fields by presenting them with the prestigious 'Master Deenanath Award' and a prize of Rs one lakh each. The founders of this reputed trust are Pandit Hridaynath Mangeshkar, Bharati Hridyanath Mangeshkar and Shriram Narayan Gogate. This year the trust celebrates its 25th anniversary of the awards, and so a two-day festival of award ceremony and concerts will be held as a tribute to the legendary theatre artiste and father of the Mangeshkars Lata, Meena, Usha, Hridynath and Asha Bhosle. The award ceremony will be followed by a solo Tabla concert by the legendary Ustad Zakir Hussain, while the next day will see Asha Bhosle in a live Concert with her musician brother Pandit Hridaynath Mangeshkar.